I had aioli on my mind. I’m not sure why, but I did. It partly had to do with Terry stocking up on deli meats and cheese at Sprouts and my desire to make a deli-style sandwich at lunch rather than throwing a frozen entrée in the microwave. I found this recipe on Epicurious and decided to try it. I scaled it back and made just enough for one sandwich, omitting the egg yolk and vegetable oil, but using the olive oil. 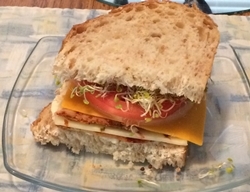 I made a sandwich with chipotle chicken, cheese, tomato, onion, and sprouts. I put the aioli on the bottom slice of bread. I thought, however, that I don’t need to make everything from scratch. And it is a bit of work to mix your own aioli when you’re putting together a sandwich as well. I looked for aioli locally and just couldn’t find it, even at Sprouts. So what did I do? I went to Amazon of course. I bought a jar of basil pesto aioli. It turned out to be a good choice. It worked well on a sandwich. I like the idea of varying the flavors in my sandwiches. That stuff is fab on grilled salmon! hmmm… That does make sense. That sounds so good! Suddenly I want a sandwich!! !